Take Command is a comprehensive interactive GUI and command line environment that makes using the Windows command prompt and writing batch files easy, faster and far more powerful. Take Command displays your command line applications in tabbed windows, with optional File Explorer-style integration for a visual look at your directories. Take Command includes hundreds of major enhancements to CMD commands such as COPY, DEL, DIR, and MOVE, and adds more than 200 new commands, 695+ internal variables and functions, a powerful batch file IDE editor / debugger, syntax coloring, advanced command line editing and programmable tab completion, macro recording & playback, and thousands of other features. Take Command is a fully-compatible Windows CMD replacement. Review Take Command and get a free license. "Take Command takes a powerful yet simple command processor and marries it with a beautifully modern interface, for a result that leaves the default Windows interface years behind." We never share or sell our subscriber list. The default Windows command processor is CMD.EXE. It is a console application that executes the commands you enter at the prompt and runs simple batch scripts (files with a .BAT or .CMD extension). Unfortunately, the CMD shell has always been woefully lacking in even the most basic features compared to the command processors available in other operating systems. And CMD hasn’t changed significantly since its first appearance in Windows NT 3.1 (released in 1993). What’s wrong with CMD and the Windows Command Prompt? CMD in Windows 10 has about 40 internal commands. That’s only a couple more than CMD had in Windows NT 3.1 25 years ago. CMD has (almost) no configuration options. There are a handful of switches you can specify on the startup line, and that’s it. There’s no way to create plugins to extend CMD; your only choice is writing new external apps. CMD can set its foreground and background colors, and … nothing else. No syntax coloring, different colors for input and output, errors, colorized directories. Command line editing in CMD is (extremely) simplistic. Filename completion is crude and non-programmable. Variables in CMD consist of the environment variables and a total of 6 internal variables. All of those internal CMD and Windows settings you’d like to query? Not from CMD. File viewing is limited to TYPE. If you want to display a page at a time, pipe to MORE. Want to go back a page, search, scroll up and down? You can’t. Aliases? Sort of. Just don’t try anything other than the most basic command alias. 25+ years into the Internet era, and CMD’s Internet-capable commands consist of … nothing. No HTTP or FTP file access for internal commands. No SSL or SSH, and no SMTP. Help is nearly non-existent. There is a paragraph or two of text output when you enter the command name followed by a /?. Want to see the command syntax while you’re constructing a command line or writing a batch file? Help on redirection, command line parsing, regular expressions, or batch file creation? Forget it. Creating, editing, and debugging batch files is a demanding task and needs an integrated solution. What is Microsoft’s solution? Edit the batch file in Notepad, run it on the command line, and see what happens. Take Command is our flagship product. Take Command is a complete Windows console replacement that solves all of the problems above, and provides you with a vastly better command prompt UI, a batch programming IDE with syntax coloring, and thousands of additional features not available at the CMD prompt. Learn more about Take Command. For 30 years, JP Software has been helping programmers, system administrators, technical support professionals, and advanced users save time and solve their command prompt frustrations. Take Command offers a new approach to working with Windows command line applications, bringing users the power of the command line and the ease of use of the GUI. Learn more about Take Command and Batch File Programming, Tabbed Windows Consoles, the Windows CMD Command Prompt, and Windows Command Prompt Tricks. Or see our Take Command Online Help for all of the details on our thousands of Windows console improvements. Take Command is the most flexible and powerful Windows command line available anywhere. And there are two versions of Take Command, so you can use the version that's perfect for your needs. See Comparing Take Command, TCC/LE, and CMD Windows Command Processors. Take Command and TCC are compatible with the CMD prompt and command line applications in Windows 7, Server 2008R2, Windows 8, Server 2012, Windows 10, and Server 2016, and are available in 32-bit and 64-bit versions. Take Command combines the power of the command line with the ease of use of Explorer. You can manipulate files in the tabbed command prompt windows and see the results in the GUI window. The integrated and familiar environment means you are immediately more productive with your interactive and batch file programming tasks. It's fast - 20-200% faster at displaying output than the standard CMD command prompt, so you get your work done faster. Take Command is fully customizable, including multiple themes, colors, menus, toolbars, and windows, so you can create the interface you're comfortable with. The TCC scripting language is a massive superset of the CMD command prompt commands, with 246 internal commands, 398 internal functions, and 299 system variables. Almost all of the CMD commands (e.g. DIR, COPY, DEL, DIR, START, etc.) are enhanced with hundreds of additional options, and TCC adds more than 200 new commands. Take Command can usually do in one or two lines what requires dozens of lines in Windows CMD commands (if it can do it at all). Most interactive commands (such as COPY, DIR, DEL, MOVE, START etc.) have command dialogs that allow you to select filenames and options and see your command line before executing it. The most powerful Windows command processor is also the easiest to use! Take Command includes an editor (TCEdit) that is optimized for editing script and ini files. Create and debug your batch scripts with the integrated graphical IDE. The IDE includes tabbed edit windows and a sophisticated debugger with single stepping, breakpoints, performance profiling, syntax coloring, tooltips, bookmarks, and tabbed variable and watch windows. The IDE also includes a Toolbox window that shows all of the internal TCC commands, variables, and variable functions organized by category. 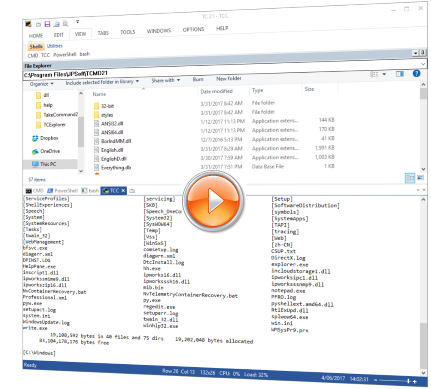 Windows batch file programming has never been easier or more powerful! Browse command line and directory history, filename and directory completion, and use numerous cut and paste options (even with Windows command line applications that have no internal cut and paste support) with the advanced line editor. All of TCC's editing keys can be redefined with the key dialog. Customize filename completion for any internal or external command or alias. This allows Take Command to intelligently select and display filenames based on the command line you are entering. You can even program tab completion using any scripting language supported by TCC (batch files, Lua, Python, REXX, Tcl, etc.). Colorize your command line with TCC's syntax and directory coloring, input, output, error, and selection colors, and ANSI x3.64 support. You can search for and then optionally symlink or delete duplicate files with the DEDUPE command. Take Command includes internal compression and extraction commands and variables for GZIP, JAR, TAR, ZIP, and 7ZIP files. Compare two directories and display files that have been added, changed, or deleted. Expand your scripts with the internal support for Lua, Perl, REXX, Python, PowerShell, Tcl/tk, and any Active Scripting language. You can even combine multiple languages in your batch scripts. Take Command is compatible with screen readers for the visually impaired. Learn about our 90-day unconditional guarantee and multi-system licensing. Compare Take Command with other tabbed windows applications for Windows command prompts.